Do you need to develop flexible software that can be customized quickly? Do you need to add the power and efficiency of frameworks to your software? The ADAPTIVE Communication Environment (ACE) is an open-source toolkit for building high-performance networked applications and next-generation middleware. ACE's power and flexibility arise from object-oriented frameworks, used to achieve the systematic reuse of networked application software. 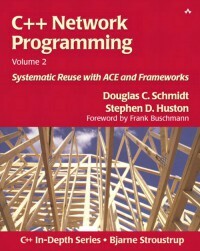 ACE frameworks handle common network programming tasks and can be customized using C++ language features to produce complete distributed applications. This book focuses on ACE frameworks, providing thorough coverage of the concepts, patterns, and usage rules that form their structure. This book is a practical guide to designing object-oriented frameworks and shows developers how to apply frameworks to concurrent networked applications. This book also teaches how to use frameworks to write networked applications quickly, reducing development effort and overhead. It will be an invaluable asset to any C++ developer working on networked applications. Dr. Douglas C. Schmidt is the original developer of ACE and The ACE ORB (TAO). He is a Professor at Vanderbilt University, where he studies patterns, optimizations, middleware, and model-based tools for distributed real-time and embedded systems. Stephen D. Huston is President and CEO of Riverace Corporation, a provider of technical support and consulting services to companies who want to keep software projects on track using ACE.